I have a confession to make. Sunscreen is not at the top of my list when it comes to surfing. In fact I am pretty lucky to end up with any on at all and because of that I have a face with the texture of a 'Chamois Leather'. The skin on my face looks twenty years older that that which is protected under the Yulex neoprene of my wetsuit. My beautiful wife is the one who has to look at 'mon visage' all day, so when she says, 'have you remembered sunscreen?' I frantically squeeze some out and rub it on, as is the way when you have 'the froth' and can't wait to get in the water. For some reason past experiences and logic go unheeded in this moment, and I forget that the last time I was in a hurry like this I didn't wipe the grease from my hands, and the first duck dive I did, my palms slipped and I ended up smashing my nose into my board. Then there was the time I put on Nivea Kids' sunscreen, which (sorry to say Nivea) does not work if you are surfing, unless blinding you for about 18 hours is what was intended. Ride SPF25 Arty wet water shot. I can hear you all now. 'Why don't you put it on when you get out of bed, James?' My retort would be that the first thing I do when I get out of bed is check the surf, normally in a 'froth' and, as I have explained, earlier the 'froth' knows no logic. So I would like to have some skin left on my face when I am a bit older, I am not a huge fan of zinc as I have heard things about the health implications of putting it on your skin, also I am not against getting some colour on my face, I just don't want to have that 'I have just been stood behind a jet engine ' look. I remembered then that about six months ago, our Surf Doctor, Nic did a review with some English chaps that had been working on a sunscreen that was water resistant, eco friendly and designed for surfers. Back then the product was at the crowdfunding stage so I contacted the guys at Ride Skincare to see how their project was going. It turns out, just this short time later they are retailing their wares and were happy to send me some out. Bingo, I thought, let's put this stuff to the test. Designed for the Outdoors, Never Tested on Animals and Made in the United Kingdom. I am the sort of person that just opens the box tries to get things working, I don't read up on things and I don't read instructions provided (especially for sunscreen) unless I really can't figure it out. When I received the Ride Sunscreen and Moisturiser I did what we all do in the supermarket, I popped the lid and smelled them both. The sunscreen smelt very faintly earthy but mainly of not much but the moisturiser made me want to eat it, smelling tantalizingly of very edible peppermint. I refrained from ingesting the blue cream and instead practiced what I thought was the done thing and put it on my face. As I am not used to testing moisturiser I can only report that it felt like moisturiser, quite nice and pepperminty. I resigned to test it again after a surf and see if that made any difference. Now down to the 'brass tacks' of this very rare skincare review on Surf Bunker, how did the Ride Sunscreen SPF 25 fare in an actual live surfing environment.The answer is it did work. I did not get burnt. I also did not slip of my board, I did not smash my 'face cushion' into the board on the first duck dive and I did not lose vision for the next 18 hours so from a personal perspective it was a huge thumbs up. As I have said, I don't read instructions so I did not see the handy leaflet the guys sent with the 2 tubes explaining the hows, whys and if's. If I had read all the stuff I would have known that trying to rub the suncream in was almost futile, as the Ride Sunscreen is designed to form a barrier on top of your skin, instead of being absorbed into your skin. Apparently this is better as the chemicals in normal sunscreen might not be all that good for that you don't want to be absorbing them. 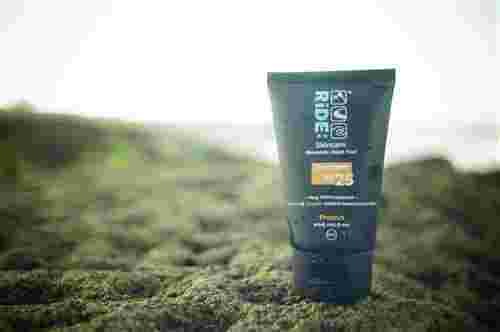 Instead, the guys from Ride use the mineral Titanium Dioxide which protects your skin from the harmful rays and they incorporate organic jojoba and coconut oil to re-hydrate your skin whilst in the the sun. Sounds like a win, win. Time to put it so the test in some sweet fun mellow waves. As soon as I got home from my surf I had a shower, washed off the skin colour Ride Protect in the shower and applied the Moisturiser called Recover. It felt nice and smelt nice but as far as turning back the clock on my face skin it did fall short. My wife has confirmed that I look no younger, only less red in the face. The Ride Protect (the sunscreen) ticked all the boxes for me, it was not greasy, easy and quick to apply, did not come off in the water and did not blind me for hours after. It also comes in a 50ml squeezy bottle so you can take it on a plane as hand luggage. Ride Recover (the moisturiser). I wanted to eat it in the same kind of way you find the smell of surf wax tantalizing. It smelt great of peppermint, felt kind of soothing and cool but did not wind back the years on my face. As stand alone products, these are great and they work amazingly, they do everything they say on the tin but maybe the bonus in all this is that they are not a huge multinational company that produce vats and vats of questionably unhealthy chemicals that you have to absorb into your skin. We thought it would be cool to fire over some quick question to Tom, the man behind Ride. SB: Hey Tom, we love what Ride has done. Where is the product made exactly? Tom: Thanks, we Make Ride right here in the UK. Specifically the bottle is manufactured in Suffolk and the actual product is made in Staffordshire. Not a cool look. Jet Engine Red. SB: How long did it take you get the formula correct and how did you test it? Tom: Overall It has taken us over 2 years to get the formula correct. This included lots of real world testing, from surfing in Devon to hot weather testing in Morocco along with high altitude winter testing in the Alps. Along with this there is the laboratory testing to comply with all EU standards for sunscreen. SB: Have you found it difficult to get the word 'out there' about Ride? Tom: The best press we have got is from word of mouth, people loving the product and spreading the word. It can sometimes be hard to explain that we are different from the regular high street sunscreens and we use a completely different method of sun protection by using a mineral rather than synthetic chemicals and therefore the product is a bit different to what they are used to. Once we explain how we are different with the health and environmental benefits that brings then they are usually on board. The guys at Ride have an ethos that they stand behind, organic, healthy and functional products that won't break the bank. For me that's a win win. Ride Protect in the wet. Ride SPF 25 Surf Sunscreen. Ride Protect Sunscreen, looking moody on the rocks. The Peppermint Ride Recover is blue. Slap on the Ride Recover after a surf and let your skin have a drink. Showcasing the skin colour eco conssious and organic Ride Protect.